Paprika pepper works well in lots of recipes, from soups to stews to goulash and many spice mixes, but an absolute favourite of mine is paprika potatoes. So why not try adding it to your mashed potatoes, boiled new potatoes or even on your roasted potatoes? The recipe below is for baked fries, so simple yet so delicious! And because they're cooked in your oven they are so much healthier than using a deep fat fryer. If you like your fries crispy - and who doesn't - put the baking sheet in as soon as you pre-heat the oven, so it's nice and hot. Also make sure you dry the potatoes thoroughly after washing. This will help with the "crispiness". Take out of the oven and sprinkle with the lemon juice and more salt if required. And enjoy! You can use any type of pepper for this recipe, but I find smoked paprika or hot Hungarian both work very well. When making my fries, or chips as we call them in the UK, I tend to use Maris Pipers or King Edwards. 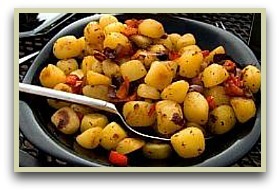 Russet potatoes also work well, but if you have a tried and trusted favourite type of potato, just use it instead. If you would like some recipes that use this spice, then have a quick look at my book. Full of easy-to-make herb mixes, masala blends and dry rubs from around the world. Available as a digital book that you can download and start using immediately. Click here to read more. The recipe above uses garam masala as a seasoning, for something different why not try these mixes?